David has been painting since he graduated from the Royal College of Art in 1975. His resume is impressive, with too many solo, group, home and international exhibitions to list. In 2018, David can be found exhibiting with the London Group and the Arborealists and of course, as part of Borough of Ealing Art Trail this September. You can find his works with the Rowley Gallery, Kensington; Water Street Gallery, Todmorden; Felix and Spear, Ealing and the Tregony Gallery, Truro. Winter Pitshanger Riverside. Acrylic on canvas. 2015. Woodland River Walk Down to Three Cliffs, Gower. Acrylic on canvas. 2018. BEAT: Did any of your family member do art or was it some other influence that sparked your passion for art? DW: My daughter recently researched our family tree dating back to the 19th Century and sadly there was no trace of anybody remotely connected to the arts. They were mostly from the East End and the Docklands area, too busy staying out of poverty. I seemed to have emerged out of the blue as an artist. However, it took hold from my early teens, almost beyond my control. BEAT: If it wasn’t family influence then what inspired you to study art? 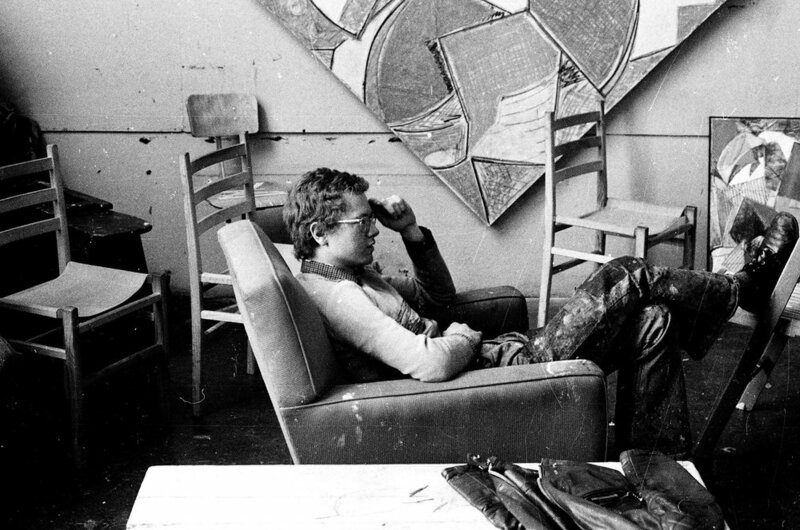 David during his studies at Royal College of Art. In the end the Art’s teacher won and I was lucky enough to go to a marvellous independent art school in Colchester. And so it was that my introduction to a life as an artist started with working in large wooden huts! I absolutely loved it and it was a very formative time. Students were totally immersed in art with some very influential teachers, such as John Carter, Richard Bawden and John Nash, Paul Nash’s brother. I spent two years there before moving on to St. Martins. BEAT: That is fascinating! What would be your top advice that you would give to young aspiring artists today? DW: Never be discouraged by making bad work. Indeed, you have to make mistakes and experiment with inevitable failures before you can make good work. Not taking risks, especially early on, means that you are only going to create safely within your comfort zone. After leaving the Royal College, I spent three happy years in a studio near Tower Bridge with a group of fellow students, and not one painting survived, although I made many. I was trying to find myself and it didn’t really happen till much later. BEAT: You have clearly developed a distinct signature style. What tools do you use to achieve the desired outcome? Calligraphy brush from Hong Kong. DW: I use a variety of tools, a wide range of brushes, rollers, sponges, etc. However, over ten years ago, my son brought me a gift from Hong Kong - a very special Calligraphy brush - which is totally indispensable for me and I use it all the time. I have tried to buy similar brushes but none live up to it! BEAT: David, I feel like I’ve just found out a major secret to your work! Once you are all geared up to paint, what is it that inspires you? DW: The landscape, the places I love. The act of painting, the challenge and the joy. A whole lifetime of looking at art, both, of the past and of my contemporaries. BEAT: How do you know when an artwork is finished? When do you stop and move on? DW: Recently I hosted a Q&A day at the London Group Open with a A Level Art students. This was their most pertinent question and the most difficult one to answer. It varies from painting to painting. Some artists have a prescribed plan of action with a predictable beginning and end. Because I try to let the painting paint itself as much as possible these days the decision on when it’s finished is unpredictable. More often than not it’s best to leave a painting before you think it’s finished, to leave it open ended, and keep it alive and moving. One of my great aims is to reproduce the constantly changing nature of the landscape and not let the paintings to become fixed and static which overworking may do. On the other hand, I will often go back to pictures and change them after thinking they were finished, and then realising they were not. BEAT: There is this fascinating debate over the concept of a “starving artist.” Is it a myth or a reality in your opinion? Do you relate in any way? DW: Being an artist is a passion and a vocation and you just plough on despite the ups and downs financially. We only have one life! Yes, it was difficult at times, especially with a house and children, etc., but you learn to support your art in many ways including teaching. It was also a great help that my wife is a potter and we both had to pursue our art making and supported each other in this, all the many years we have been together. We both have our various studios in our garden. Even when the house is on the point of collapse new studios go up regularly! Only bringing up our two wonderful children is an equal priority. Also, having the support of your friends and fellow artists is incredibly important. River Brent Autumn Light. Acrylic on canvas. 2017.. BEAT: If you could have a drink with one artist living or dead, who would it be? DW: Patrick Heron. I taught with him occasionally at Winchester School of Art in the 80’s and he is one of my heroes as an artist and a writer. BEAT: Is there anything you dream about doing in your field? DW: Paint a painting that is half as good as any one by Matisse, Constable, Turner, Braque, Monet, Bryan Wynter, Patrick Heron, Hans Hoffmann, Miro, Klee, Van Gogh, etc.